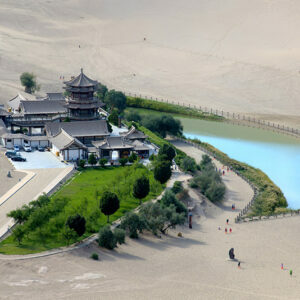 Traverse through the most diversified area of China in terms of land and the people living on it. 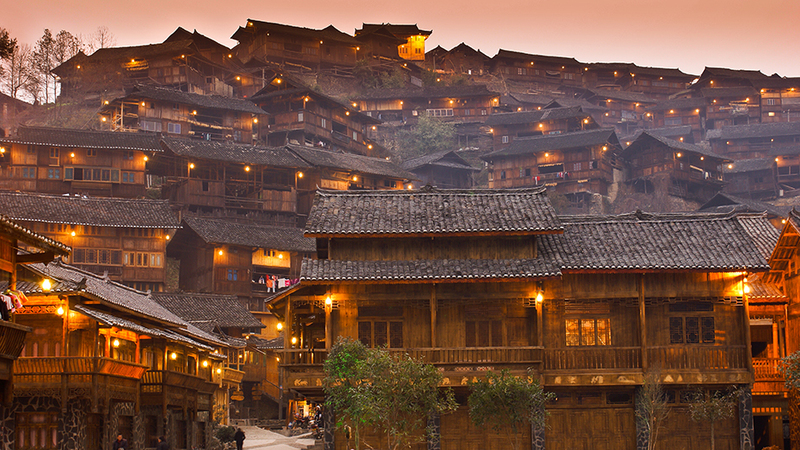 From the Hakka Earth Buildings – Tulou clusters, to numerous tribal villages of in Guangxi, Guizhou and Yunnan. 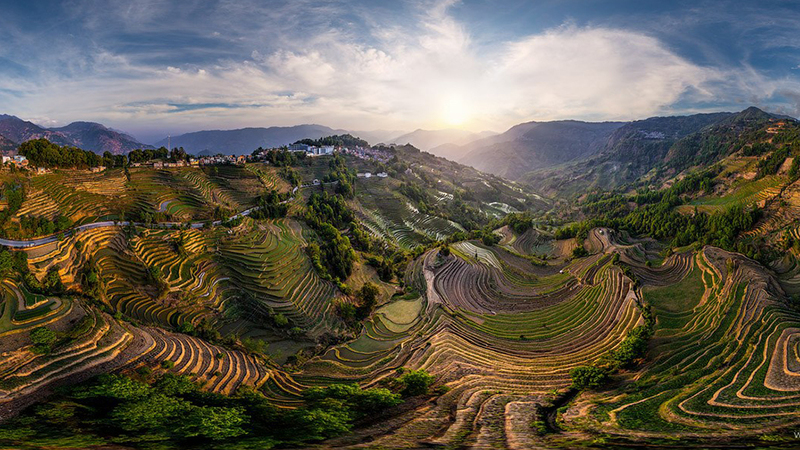 Visit the local markets, marveled at the breathtaking scenery vista of Yuanyang Rice Terraces, without a doubt the possibly the most impressive in the whole of Asia. Upon your arrival, our local tour guide will greet you at the airport and transfer you to your hotel. 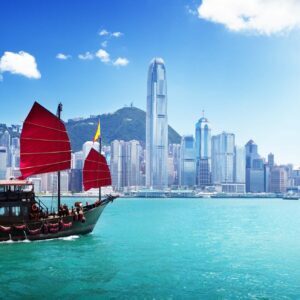 Enjoy a city tour of Xiamen. Your first stop is at the South Putuo Temple with a history of over 1,000 years. Then take a ferry to Gulangyu (Drum Wave Islet) which is considered as an architecture museum. Have a walk on the island appreciating the buildings and breathing the fresh air. Visit the highest point of the Island Sunlight Rock and enjoy a stunning panoramic view. Move on to Suzhuang Garden which was a private villa and now a piano museum. Explore more of the beautiful Tulou in the area with Nanxi cluster consist of Huanjilou, Zhenfulou and Yanxianglou and we will discover Chengqi Lou, Wuyuan, Shize and Qiaofu Lou. See stylish Zhenchenglou which combined both Chinese and western architectural style and palace style Kuijulou, Fuyulou as well as Rushenglou. This morning, continue to visit the Fuxing lou and Chuxi Hakka House which is regarded as the most beautiful and natural hakka village in hakka area. Return to Xiamen in the afternoon. Overnight at the hotel in Xiamen. 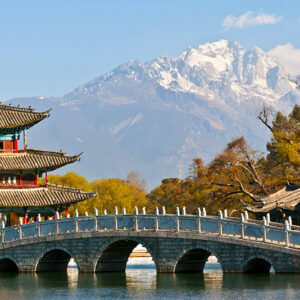 Transfer to the airport and fly Xiamen to Guilin. Spend the balance of the day touring Guilin’s beautiful hills such as Elephant Truck Hill and Piled Silk Hill and the Reed Flute Caves. Stroll around the Fir Lake and Banyan Lake in Downtown Guilin at night, the view is magnificent. 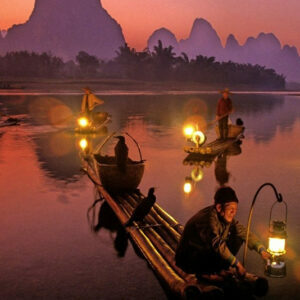 After a cruise down the Li River through China’s most famous landscape, you arrive in Yangshuo and check-in at the hotel. The balance of the day is free. Tonight enjoy – Impression of Liusanjie. Enjoy a biking tour to explore the beauty of the countryside followed by a bamboo rafting along the Yulong River up to the Bridge of Dragon for breathtaking scenery along both sides of the Li River. Terraces are stacked on top of each other up the steep mountain. 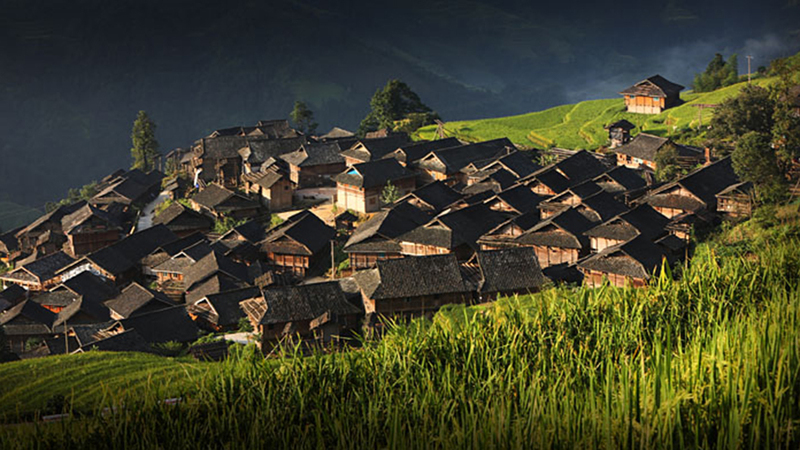 Walk along paths in the village and see daily life of Yao people. Upon arrival, check in at the Lian Lodge for two nights. Balance of the day is free at leisure. Drive to Sanjiang by road and up on arrival, check in at Sanjiang Fengyuqiao International Hotel. Enjoy the rest of the day visit the remarkable Chengyang Yongji Dong Bridge (Also known as Changyang Wind & Rain Bridge, built by the Dong a century ago with covered pavilions and porches that provide shelter from the elements. Continue to see Batuan Bridge and Mapang Drum Tower and a scenic hike to a nearby Dong village. Hotel: Sanjiang Fengyuqiao International Hotel. A morning visit to the remote village of Jitang offers further insight into the enduring life and ways of the Dong people. Situated high on a mountain with inspiring views across the terraced valley, Jitang’s three Drum Towers are all constructed of wood without any nails! In the afternoon, visit the Longtu Village to see roofed bridge in Longtu and the drum tower in Gaozeng. Take a spectacular drive through the lush valleys to visit Basha Miao village located among the primary forests in the Moon Mountain. Basha Miao Tribe is known for the preservation of its ecological environment and tribal tradition of thousand years old. You will note Basha man’s unique hairstyle and ancient warrior outfit with a knife and traditional fowling piece. After lunch visit Yintan Dong village, then keep driving via Xindi Town to Zengcong to see the 25 meters tall Zengcong Drum Tower which is the oldest and the most beautiful drum tower known. Continue to old town Rongjiang, means Banyan tree and river in Chinese, where we will stay overnight. Continue drive to Xijiang passing through Pingjiang, Paika and Leishan with short visit en route it time permits. Visit Chejiang Dong village, then drive to Xijiang village. 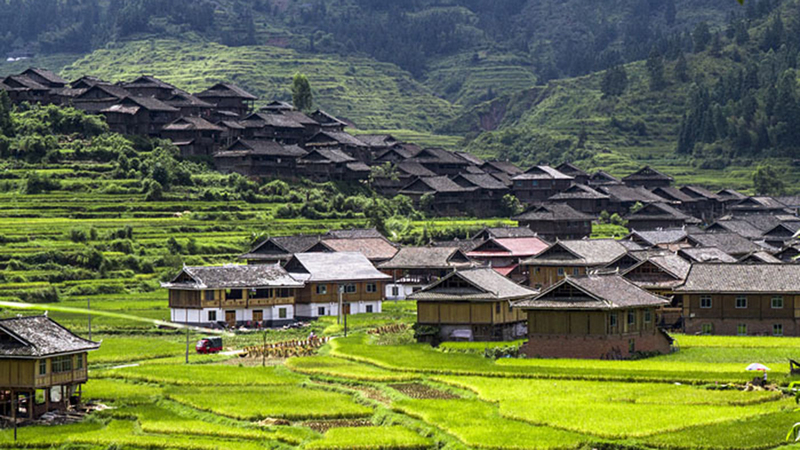 In the morning visit the Xijiang Miao Ethnic Village, known as ‘China’s Miao stockade village of one thousand households’ and supposed to be the largest Miao Village in China. Set in a natural basin and bordered by paddy fields drenched in green, A continuous row of houses spreads in line of the hilly area. These houses are unique and grand under sunshine and verdant trees. 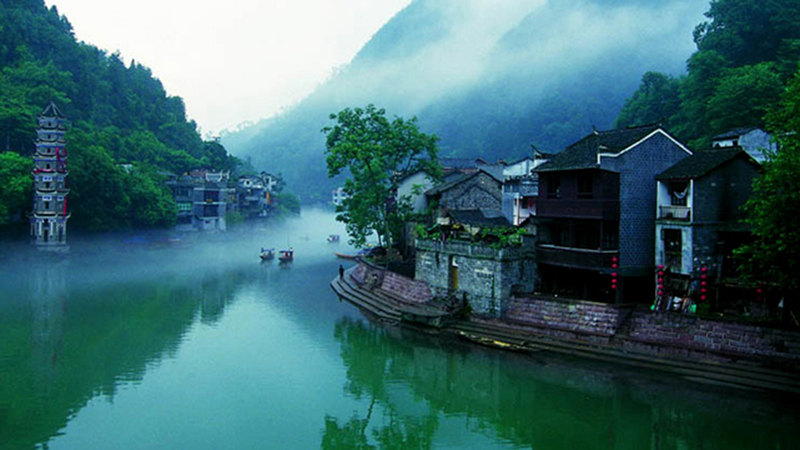 Stay overnight in Xijiang Village. 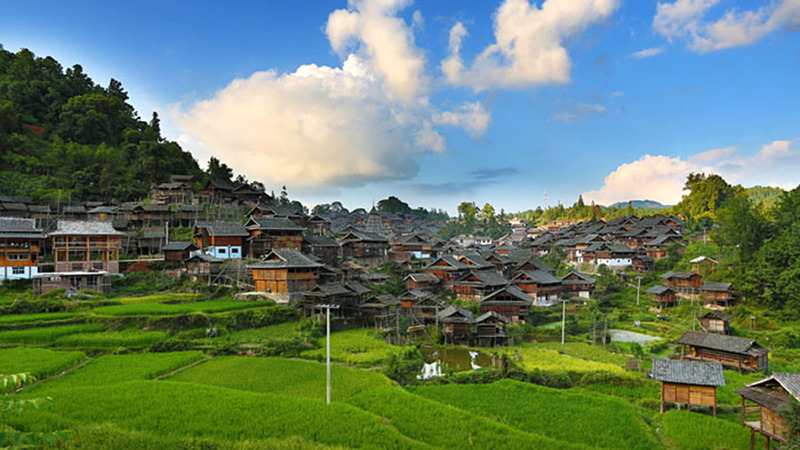 A drive of 1 hours brings us to the Upper Langde Miao Village, a typical Miao community known as the Miao’s Ethnic Village Museum with different Miao’s style houses and beautiful bridges in the river valley. It is also known for handicrafts including silver ornaments, embroidered costumes and local lusheng music and dance performance. The villagers in Langde wear long skirts, hence they are ‘Long-skirt Miao’. Afterward, continue to Kaili, the center of this scenic region and gateway to many colorful ethnic minorities in villages nearby. This afternoon, visit Nanhua Miao village and Kaili museum houses a collection over ten thousand items of different ethnic groups including handicrafts, written documents, paintings and other works of folk art. 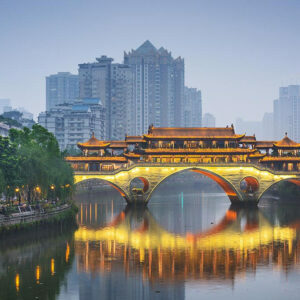 Drive to Guiyang, the provincial capital and on arrival check in to the hotel. This afternoon visit the Jiaxiu Tower, the city’s historical icon. Have a stroll in the Qingyan Ancient Town, a town completely contracted with Stones. Today we drive to Anshun and visit Huanggeshu Waterfall, the largest waterfall in Asia. On the way visit Tianlong ancient town and enjoy the local grand opera of Laohan ethnic group. Return to Guiyang Airport and fly to Kunming. Arrive in Kunming, Yunnan Province which is made up of twenty six ethnic nationalities. Depart Kunming in the morning and drive to Jianshui via Tonghai where you will visit the Tonghai Xiushan Park. 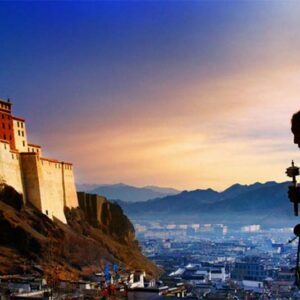 Enjoy the Cave Music Show in the xiushan park, Visit Muslim Village, Mongolia Village. And drive to Jianshui, once the economic and cultural capital of Southern Yunnan. You will appreciate the typical architecture of the town: Tuanshan village for its well preserved architecture and local village atmosphere. The village has currently 237 households and over 90 percent still bear a common family name of Zhang. 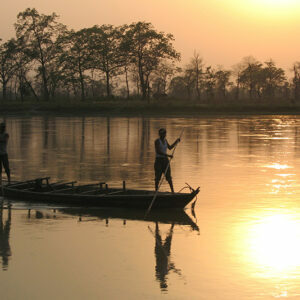 With four gates at the directions of east, south, west and north, the village is self-sufficient. A dozen of old residences survived from the Cultural Revolution in the 1970’s and fine works of wood and stone carvings can be found all over the village. Upon arrival, take a city tour to visit Family Zhu’s Garden. The Private Garden of the Zhu Family lies in Jianxin Street, Jianshui County and has a total area of 20,000 square meters and a floor space of 5,000 square metres. As it was built by Zhu Chaoying and his brother in the late Qing Dynasty, it got the name ”the Private Garden of the Zhu Family”. With the well-arranged yards and well-furnished rooms and halls, the structure of the architecture can be described as ”streamlined”. It enjoys the fame ”the Daguan Garden at a Border Town”. Large and magnificent buildings like the Private Garden of the Zhu family are now rarely seen in China. Today, it is one of the provincial cultural relics. Take a short walking tour in Jianshui to see the famous ancient wells still preserved in Jianshui, stroll along the colourful streets of the town and the fortified walls near the Muslim quarter. Morning, visit the Confucian Temples, The Jianshui Confucius Temple, the biggest temple in Yunnan Province, is located near the north gate to Jianshui and is now one of the provincial historical relics. It is recorded that it was built in 1285. The temple covers an area of 114mu, imitating the style of the Qufu Confucius Temple, namely, a central axis structure like a palace. 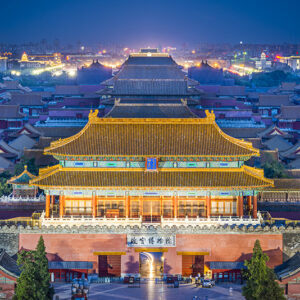 This complex includes a main hall, two side halls, three pavilions, four gates, five clan halls and eight memorial archways, all of which are kept splendidly. 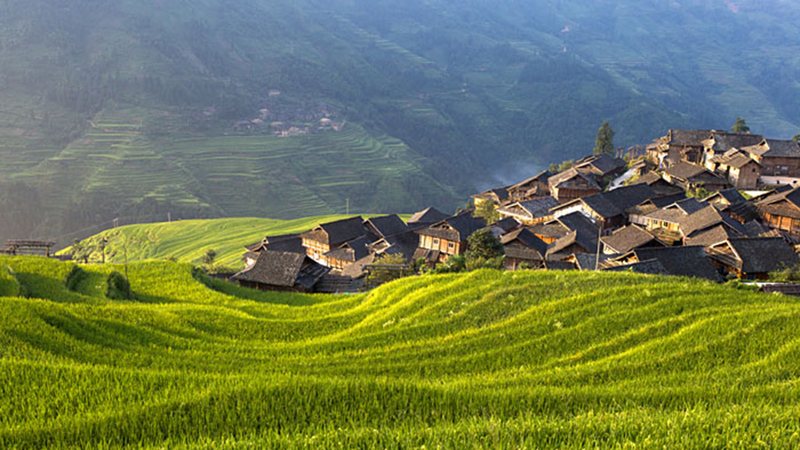 And then drive to Yuanyang, famous for Hani minority’s rice terraces. The Hani, otherwise known as the Akha in Southeast Asia, number around 1.5 million and are mainly to be found in Yunnan. In spite of their modest numbers (compared with the scale of the Chinese population as a whole), they are famous for they mastery in the art of rice terrace sculpting and drainage systems. It is believed that they were the first people to implement this rice production method. Often living in rugged areas where fertile land is hard to come by, throughout the centuries the Hani have adapted their farming methods and have transformed 12,000 hectares of hillside into arable land making rice production their principal source of income. Nowadays tourism brings much money to the region, also considerably improving the local infrastructure. It is hard to describe in writing the Yuanyang rice terraces, which are without a doubt the most beautiful in China and possibly the most impressive in the whole of Asia. Even UNESCO recognizes the natural beauty of the rice terraces and is in the process of registering them as a World Heritage Site. Cascading down the mountainside through bamboo canals, the water transforms the mountain face into a truly wonderful vision giving the impression that the rice terraces are steps for giants leading to the mountain top. Morning, visit the Nuijiaozhai market, the best site to meet Hani, Yi, Dai, Miao and other minorities inhabited in the area. And then, drive to Duoyishu, where the rice paddies seem to melt into the valley floor. It is sometimes difficult to see the hilltops, especially when the cloud base is low and they mix with the crops in their terraces, giving photographers the chance to snap one of nature’s real masterpieces. You’ll then walk through the rice terraces starting at Bada, although the view from Duoyishu and Laohuzui are more impressive, the view from Bada is special for its visceral beauty. Your view is from a less elevated vantage point, you are much closer to the terraces themselves enabling you to take in the full glory of the work of the Hani. Depending on the season you may be able to enjoy the sun sparkling on the water in the rice paddies and the crickets chirping in the trees. It’s an unforgettable experience. The trek will take around 6 to 7 hours, you will be able to see, without disturbing their toil, some of the local men and the buffalo working the fields while the women pick the rice. 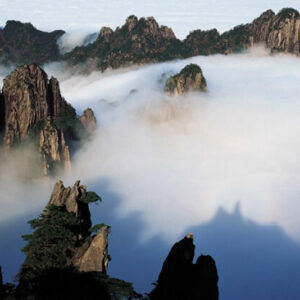 You will be rewarded for your efforts in Laohuzui, literally “The Tiger’s Mouth” where you can enjoy the sunset. Here rice terraces continue as far as the eye can see, and the panorama is breath-taking, even dizzying for some. It is recommended to wrap up warm as the early morning can be rather fresh. Morning, enjoy the sunrise at Duoyishu. Drive to trail head, start our scenic hiking across rice terraces to Shen Chun, a small village across big valley from Yuanyang, en route we enjoy wonderful view of rice terraces to our hearts’ content, scenery around us would give an illusion that we are walking in a picture. 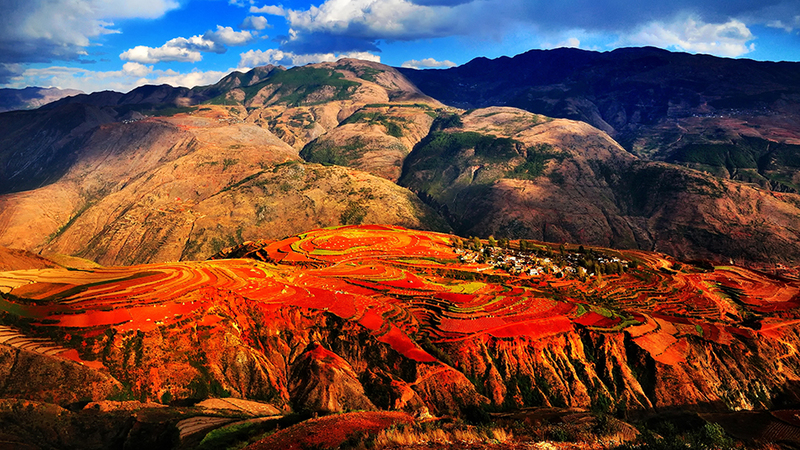 Ancestors of Hani and Yi people spent more than 1200 years asserting thousands of terraces on side hills, during their arduous work through generations for food, undesignedly they created the most inspiring scene in southern Yunnan. Visit a local market in Hani Minority Village. The market is held daily, rotating between the villages of Niujiaozhai, Shengcun, Panzhihua, Yuanyang, Huangcaoling, Laomeng. Depending on a complex system based on the lunar calendar. On “dragon sign” days the market is held in Yuanyang, but if it’s a “pig sign” day the market will be held in Shengcun and so on. It is mainly the Yi and the Hani who come to buy their supplies for the week ahead or who sell their produce on the market. The busy market is to be savored for its traditional hustle and bustle and its bright and vivid colors. Continue to Malizhai to see the beautiful and unique mushroom house of the Hani Nationality which distributed along the sloping terrain, in varying heights and picturesque disorder, created a pure and diversified scene. It is warm inside the house even in the chilly winter while cool in the scorching summer. 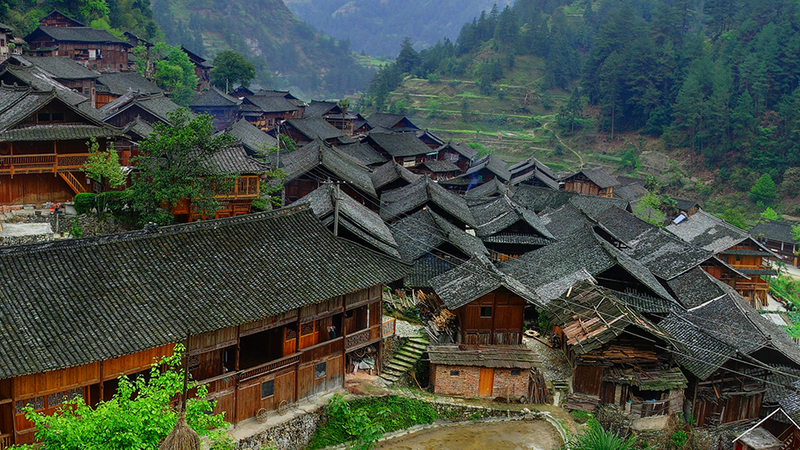 The Malizai in Yuanyang County, Honghe State is the largest village of Hani Nationality. Full day excursion to visit Lao Meng, a small town seated by the river, warmer compared with Yuanyang, on the way if time permits drop in some Dai village. Morning, drive to Panzhihua, this city lies in the south-western part of Sichuan province and borders north-western Yunnan Province. Visit Panzhihua Market. Later, continue drive to Jinping, a small mountainous county bordered with Vietnam in the south, from where border is only 40 km away. Miao and Yao are main residents of Jinping, during our long drive across their rice terraces and villages, do random stops for stretch, taking photos or short visit to ethnic villages along the way. Night in Jinping. Jinping is where many an ethnic minority lives. Visit the Yi Minority Maanshan village, Hani Minority Malutang village and Red Yao minority Xinzhai village, all situated in the surroundings of Jinping. Drive to Mile which is well-known for its Hot Spring Resort and a Giant Buddha. Visit the Mile Giant Buddha on a mountain top and winery at Yunnan Grape Ecological Garden. Enjoy the hot spring in Huquan Spring Resort in the late afternoon. Continue to Kunming and stop en route to pay a visit to the Yi village where one of the subgroups of the Yi ethnic group – Axi lives there. There are about 200 households of Axi, known for their ritual and folk dancing, unique costumes. Arrive in Kunming and transfer to the hotel. 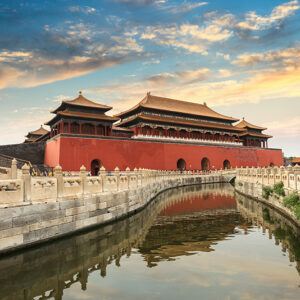 Today visit the Western Hills from where you will have a good view over the city, the Dragon Gate, the Huating Temple. In the afternoon, discover the quietest temple of Kunming, Bamboo Temple, famous for its hall of the five hundred arhats, disciples of Buddha. 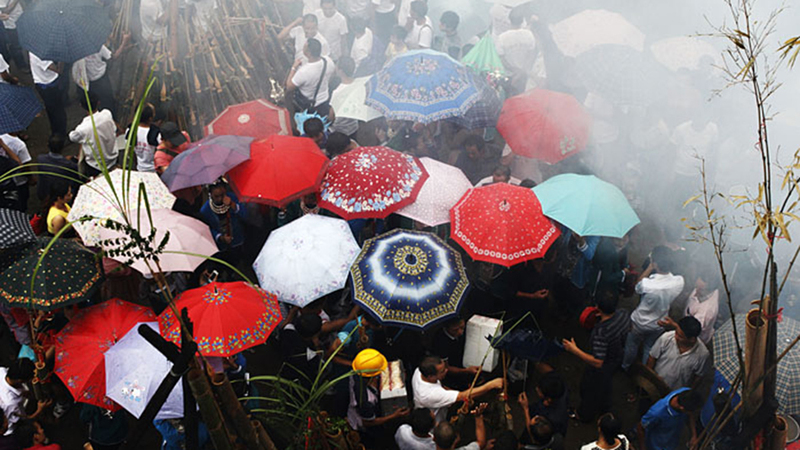 Many of China’s minorities live in the rural area of Guangxi, Guizhou and Yunnan. This journey takes you off the beaten path, to the little-visited villages, a long, scenic drive through the Southwestern China.